Jammu and Kashmir Democratic Freedom Party chief Shabir Shah said today that his party would not take part in the forthcoming Assembly poll in Jammu and Kashmir till these become part of a process which leads to the solution of the vexed Kashmir issue. The Bahujan Samaj Party today announced its support to the nominee of the National Democratic Alliance for the vice-presidential election. Whatever the BJP, a major constituent of the NDA, decided on the issue would be acceptable to the party, BSP leader and Uttar Pradesh Chief Minister Mayawati said. The Special Service Bureau and the state Special Task Force personnel have been rushed to strategic locations along the Indo-Nepal border in the state following a tip-off by the central Intelligence agencies that 250 Maoist extremists have sneaked into Bihar for a Lashkar-e-Toiba-backed operation. The UP Minority Commission has asked convent schools to make salwar kameez, instead of skirt, the compulsory dress for girl students. Principals of convent schools have taken an affront to such an order. Till now only the saffron organisations used to issue such bizarre orders. 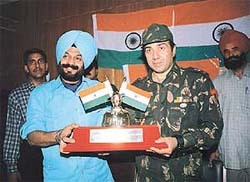 Cine star Sunny Deol receives the "Shaheed Bhagat Singh Award" from Mr M.S. Bitta, Chairman, All-India Anti-Terrorist Front, in Manali on Friday. The award was given to Sunny for spreading the message of patriotism and national integration through his latest movie "Shaheed". Shiromani Akali Dal president Parkash Singh Badal today promised a new religious channel and a memorial to the victims of the 1984 riots in the Capital if he retained control of Delhi’s Sikh religious body in its coming elections. Nepal’s King Gyanendra begins his six-day state visit here tomorrow with the almost out of control Maoist insurgency and violence at the back of his mind. There is no proposal to acquire more land in Ayodhya, apart from the existing 67 acres, Commissioner Faizabad Division J S Deepak said today. With a little over two months to go for Chief Minister N.D. Tiwari to seek election to the state Assembly in order to remain in his chair, he has announced that he will contest election from the Ramnagar constituency. The faculty and students of Veenus Vidyalaya in a remote village in Salem district today overwhelmed Tamil Nadu Chief Minister J. Jayalalithaa by presenting her a 7.2 km-long congratulatory greeting on her returning to power. The banner containing congratulatory messages is handed over to Ms Jayalalithaa on Saturday. The Indian Army unexpectedly announces a cash compensation for widows of soldiers killed in wars between 1962 and the Kargil conflict of 1999 with Pakistan. Jammu and Kashmir Democratic Freedom Party (JKDFP) chief Shabir Shah said today that his party would not take part in the forthcoming Assembly poll in Jammu and Kashmir till these become part of a process which leads to the solution of the vexed Kashmir issue. Shah told The Tribune here that his party was not opposed to elections but no useful purpose would be served by participating in them at this juncture. The JKDFP leader, who came to Delhi after reduction in tension between India and Pakistan, indicated that he would meet Prime Minister Atal Behari Vajpayee during the latter’s visit to Kashmir in July. “If I am invited, I will meet the Prime Minister,” he said. Mr A.S. Dulat, OSD in the Prime Minister’s Office had met Shah yesterday. The JKDFP leader said India should accept Pakistan’s proposal of “unconditional talks’’ and the two countries should accelerate the process of de-escalation along their borders. He said Kashmiris could be later associated in the Indo-Pak talks to find a lasting solution to the Kashmir problem. Shah, who has differences with the Hurriyat Conference, however, said the Hurriyat proposal of talking to India and Pakistan alternately could also be accepted. “There are bright indications, at present, of a ceasefire in Jammu and Kashmir,’’ he said. He described as “useless” the talks initiated by envoy K.C. Pant with Kashmiri groups, saying that the Centre’s envoy had no clear roadmap of progress on the vexed issue. He hoped that the Prime Minister would initiate a process which was acceptable to those Kashmiris who were feeling alienated. “A core team could be set up for talks,” he said. Asked about the opposition by some separatist leaders to the presence of foreign militants in the valley, Shah said the foreign militants would leave once they realise that a solution had been found according to the wishes of locals. The JKDFP leader will meet representatives of Kashmiri Pandits tomorrow. He would also meet several Delhi-based envoys next week. The Bahujan Samaj Party (BSP) today announced its support to the nominee of the National Democratic Alliance (NDA) for the vice-presidential election. Whatever the BJP, a major constituent of the NDA, decided on the issue would be acceptable to the party, BSP leader and Uttar Pradesh Chief Minister Mayawati said. The party had supported Mr A.P.J. Abdul Kalam for the presidential post. Ms Mayawati alleged that a conspiracy has been hatched to create divisions between the BSP and the BJP. She denied any fissures between the two parties, saying that this was merely a creation of the media. "The two parties are not on a collision course. There is no difference on any major issue," she said, while talking to reporters last night after unveiling a new industrial policy for Uttar Pradesh. Ms Mayawati denied stating that the BJP would have lost half of its legislators in the event of a re-election, if it had not supported the BSP for forming a government in Uttar Pradesh. She accused the media of distorting her statement, giving an impression that there were serious differences between the two parties. She said the coordination committee in the state had not taken shape as yet. So, the question of removing or inducting any person from the committee did not arise. The Special Service Bureau (SSB) and the state Special Task Force (STF) personnel have been rushed to strategic locations along the Indo-Nepal border in the state following a tip-off by the central Intelligence agencies that 250 Maoist extremists have sneaked into Bihar for a Lashkar-e-Toiba-backed operation. Intelligence sources here maintained that after the US pressure on Pakistan, Lashkar-e-Toiba militants had started “shifting its base and area of operation from along the western border to Nepal. A “willing ally” Maoists in Nepal had given them logistic support and Lashkar-e-Toiba had recently helped sneak around 250 Maoists into the dense forests of Balmikinagar in East Champaran which incidentally was also a tiger reserve. The reserve is notorious for being a virtual den of smugglers and extremists as ‘no government authority for the past many years have attempted to make its presence felt in the area’. The sources said the Lashkar-e-Toiba rank and file received active support and logistics from the Dawood Ibrahim gang in Nepal. Dawood was popular there as the South Asian Don (SAD) and was known to have property in Kathmandu and Birganj. The militant outfits’ alliance was alleged to be a handiwork of the ISI. Intelligence men had identified a militant named Salauddin, who was reported to have been handed over the charge of Lashkar-e-Toiba operations in Nepal. After a recent high-level bilateral meeting of officials of India and Nepal the state government rushed a squad of the STF to hilly areas of Bagha district in east Champaran, near the Indo-Nepal border. The intelligence men had reported that the MCC was providing training to activists of Communist Party of Nepal in Bhiknathori hills. The UP Minority Commission has asked convent schools to make salwar kameez, instead of skirt, the compulsory dress for girl students. Principals of convent schools have taken an affront to such an order. Till now only the saffron organisations used to issue such bizarre orders. The diktat coming from the minority commission is confusing, said a Principal of a convent school of the state capital. In a recent meeting the commission asked the schools — both convent and Muslim – to change the dress code of girl students. It said instead of skirt, the girls should wear salwar kameez in congruence with the Indian culture. As the news leaked out, principals of convent schools held a meeting to chalk out a strategy to meet the challenge. As the commission started drawing flak from all quarters, officials came out in defence of the order. Though the Chairman of the commission, Mr A.K. Massey, is out of station, one of the senior members of the commission told The Tribune here today that change in the dress code was “only a suggestion for the schools controlled by minority organisations”. Around two years back the Bajrang Dal and the Hindu Mahasabha had asked the convent schools to change the dress code of the girl students. That time too the principals and Christian organisations had opposed the move of the saffron brigade. It is unfortunate that the commission has taken on the mantle of cultural policing, said Rev Christopher Rodriquez of St John’s School. No one has got an answer to this poser. Even the commission is looking at ways to wriggle out of the crisis. “We will launch a new religious channel in the capital, grant autonomy to the DSGMC’s educational council and set up a finance control committee for management of the gurdwara funds,” he told a news conference here. “An inquiry will be conducted into allegations of financial irregularities with regard to donations,” said Mr Badal today. Addressing newspersons here, Mr Badal said the “policy of confrontation” adopted by Captain Amarinder Singh was having a “bad effect” on the state and could disturb “peace and harmony” in the state. The police are registering cases and arresting whomsoever they want to. All cases are false,” he said, while announcing his arrival in the Capital to boost the electoral prospects of SAD in the Delhi Sikh Gurdwara Management Committee poll to be held on June 30. He alleged that old cases were being reopened “in an attempt just to harass Akali leaders”. Mr Badal alleged that Akali leaders were being “selectively targeted” and “framed in false cases” by the Amarinder government and asserted that his party would fight back “politically and legally”. He said following his request to the Prime Minister to intervene to “save” Akali leaders, an NDA team would visit Punjab next month to “assess the situation”. Mr Badal also denied any links between his party and suspended Chairman of PPSC Ravinder Pal Singh Sidhu and said he had been appointed during the Congress rule. For the crucial DSGMC poll, almost all sitting MLAs of the state have arrived in the Capital to boost the party’s prospects. The king who ascended the throne in the most unfortunate circumstances last year and is on his first trip abroad, is likely to seek more of Indian help, both technical and military, in combating the Maoists. India had assured Nepal of providing all kind of assistance in combating the Maoists. The Maoist insurgency in the Himalayan kingdom has almost threatened the very foundation of the state. India has also provided equipment and training to the Nepalese army in fighting insurgency besides, deploying special force along the border to prevent Maoist activists from sneaking into the Indian side. During his visit, the king will meet Prime Minister Atal Behari Vajpayee, Home, Defence and External Affairs Ministers and discuss with them the whole range of bilateral issues as well as regional situation, a Ministry of External Affairs spokesperson said here. He will also interact with former Prime Ministers — Chandra Shekhar, I.K. Gujral and P.V. Narasimha Rao and Congress President Sonia Gandhi. The spokesperson underlined that constitutional monarchy and multi-party democracy are twin pillars responsible for the stability of the kingdom. The issue of bilateral trade and two countries coming together in other fields is also likely to come up during the visit. Besides India is also likely to press Nepal further for not only controlling the movement of ISI operatives in that country, but also seek the complete dismantling of the ISI operations from there. The government made regular review of security arrangements around Ram Janam Bhoomi complex in the wake of threat perceptions from terrorists, agitators and anti-social elements, he told reporters here. “Necessary changes are made in accordance with prevailing situations in Ayodhya,” he said. Mr Yogambar Singh Rawat, sitting MLA of the Congress, vacated the seat last evening to pave way for Mr Tiwari to seek election to the state Assembly. Mr Tiwari, who is a Member of Parliament from Nainital parliamentary constituency, took over as Uttaranchal’s Chief Minister on March 2. As per constitutional norms, he must get elected to the state Assembly anytime before the expiry of the stipulated six-month period to continue as Chief Minister. In a statement, Mr Tiwari said he had taken the decision as per the wishes of the party high command. Meanwhile, according to a notification issued by the Secretary, Vidhan Sabha, Mr Rawat’s resignation from the 56-Ramnagar Assembly seat has been accepted.